Is 2018 your year to leap? Would leaping into your greatness be easier if you were accompanied by an Oracle and a small but mighty tribe supporting you as you begin to fly? Does the idea of being part of an amazing collaboration fill your heart with excitement? The idea for this Mastermind literally hit me like a lightning bolt one day as I was driving. I received a vision of an amazing group working both individually and as a collective to expand, evolve, create and shine their light! This information came so strongly to me that I had to pull off the road into a Costco parking lot to begin to scribble notes on a receipt. 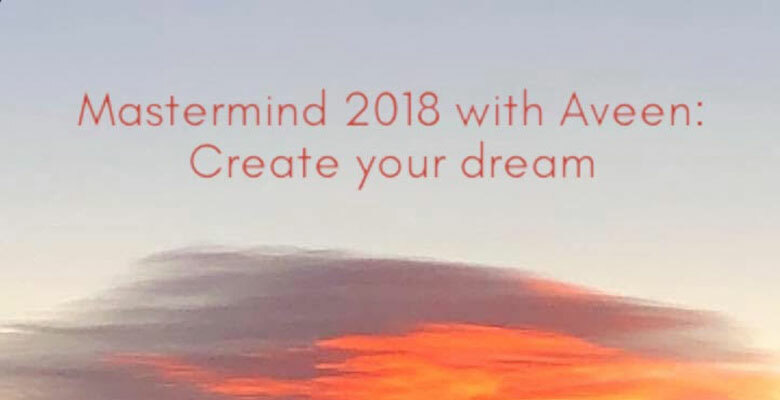 From that moment, Mastermind 2018 with Aveen: Create your Dream began to form. If you are reading this, perhaps you are answering the call. 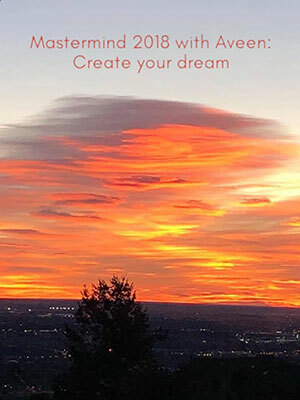 I am seeking bold, loving, creative and joy-filled souls to answer the call of their soul; to show up for themselves and the amazing mastermind group that is already forming in the world of dream. You are here on this planet for a purpose. You have gifts to unpack and offer to the world. These are gifts that only you can share. 2018 will be the year that the world receives these treasures. Do you feel the tide rising? Beautiful soul, you came here for a reason. It is time to shine. What are you seeking to Create in this lifetime? What do you dream about? Read about? Spend time online researching and following? What could you spend hours doing only to glance at the clock and notice hours have passed? What are you dreaming of birthing into this world? Why have you kept that big dream tucked away? Maybe you have convinced yourself it is not the right time. Maybe you have started and stopped a dozen times before but did so alone and without declaration or support. There is tremendous power in sharing your soul’s biggest, most audacious desires out loud. Let this be the time and the group where you not only state your dreams but also begin to create them in this reality. Vision has shown me that by stating our desires out loud is a vital step in the creative process. This takes courage but when you can do it, you are showing the Universe that you are in fact ready to receive this dream into your life. Don’t die with your biggest dreams and creations patiently waiting within you to be created. Don’t think that you need every step worked out before you can begin. The need for plans and perfection has killed many dreams. Instead, state the dream and take the leap. Your soul will always catch you. Choose 2018 as the year you will step into your power and Create as only you can. Each of us has tremendous gifts given to us by God that only we can unwrap. Offer you accountability by both working individually Aveen and with the group. Give you sustainable results in expanding your vision and living your light. This Mastermind will offer you both individual, ongoing guidance with Oracle Aveen and collaborative work with a circle of amazing peers. If you love the idea of combining intention, intuition, energy and a little magic to create what only you can bring to this world then please, sign up now. There are only twelve spots available in this Mastermind group. If this offering is calling to you, claim your spot today. One hour intro phone or Skype session with Oracle Aveen to crystallize your personal goals at the outset of the program. Twice monthly 90 minute Mastermind group sessions from wherever you are in the world via video conferencing. I will facilitate these sessions. There will be time for check-ins, next steps and experiential practices based on what we are creating. All sessions will be recorded for you to review afterwards. Twice monthly studio hours where you will meet in smaller groups of two or three to work on ongoing projects, brainstorm, get feedback and connect with the energy of your supportive mastermind community. Private Facebook forum to meet in between our calls. Here we will post intentions, celebrate our wins, seek encouragement when we need it and watch as our dreams crystallize from the world of dream into the world of form. Cost for this program: $1497 when paid in full. If you are on the fence, email me and we can set up a time for a quick chat.